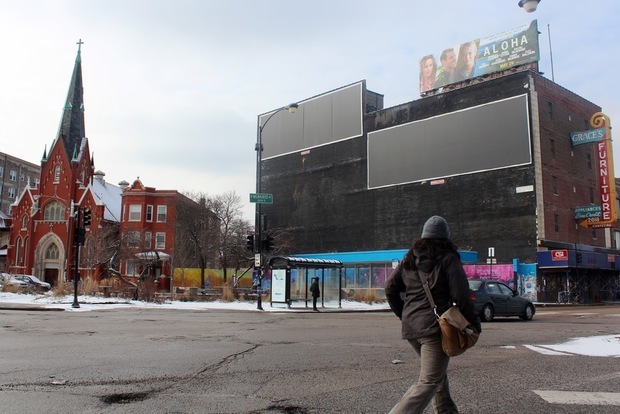 A fight over two large billboards overlooking the square in Logan Square is over. LOGAN SQUARE — The years-long fight over the billboards overlooking Logan Square proper is over. And with the end of the legal fight over the billboards, the path is cleared for the future development of the former Grace's Furniture building, which is one of the most prominent structures overlooking the square and the Illinois Centennial Monument. While the fight was not over the infamous "Aloha" billboard, that gained national attention due to its lengthy stay in Logan Square, it does mean the building that supported the informal neighborhood monument is due for a new beginning. "The only thing I can say is we want this building to get developed and to move forward," said Grace Martinez, whose family has owned the building since 1976. Any sort of development of the building at 2618 N. Milwaukee Ave. had been held up for years due to the legal battle. The owner of the billboards, which have been blank for years, sued the city over the 2013 decision to block signs on the side of the building. Because of that, the owner of the property had been unable to redevelop the building as potential users, including a rumored hotel, would have had a large portion of the side of the building facing the square blocked by signs. A developer behind the hotel project had been holding back due to the pending legal issues, sources said. Martinez declined to get into specifics of what type of development is being considered for the site, but said her family is working with someone on a lease and details would be available in a few weeks. "I think this is right in the center of Logan Square," she said. "It is really going to make things turn around and will be a great building for the whole community. My family, that's what they look forward to." VisualCast, which has sued the city twice over the billboards, did not respond to request for comment. The lawsuit filed by VisualCast challenged a decision by the Chicago Landmarks Commission to deny permits for the two large billboards on the side of the building. On Wednesday, Cook County Circuit Judge Celia Gamrath affirmed the landmarks commission's decision. The decision could still be appealed to a higher court, but the owners of the building plan to move forward. "This has been going on for a very long time," said Andrew Schneider, president of Logan Square Preservation. "A bunch of the neighbors have been fighting the billboards for many, many years." The billboard company and the building owner had the proper permits to hang the billboards back in 2013, but the matter had to go through the landmarks commission. The commission rejected the billboards in May 2013. There had been billboards on the side of the building in the past, but for the past decade or so, the only signs that had been hung were done so illegally and residents successfully fought to remove them. The neighborhood's boulevards and the square itself were designated an official city landmark district in 2005. "It is a victory for us and victory for the city's landmarks too," Schneider. "We are going to end up with hopefully a really beautiful backdrop to the Centennial Monument in Logan Square." The most popular billboard, the Aloha Billboard, came down unexpectedly in May, shocking much of the neighborhood just before plans for a makeshift tiki party to celebrate its one-year anniversary.